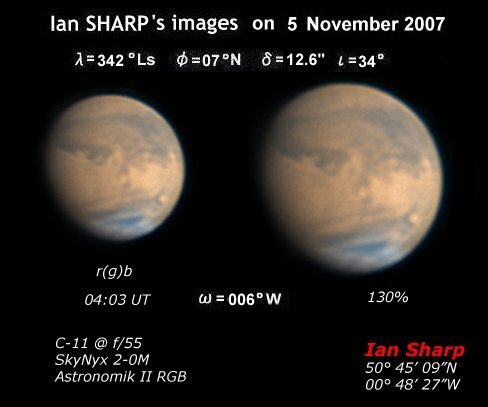 The planet Mars has now come back in the morning sky. 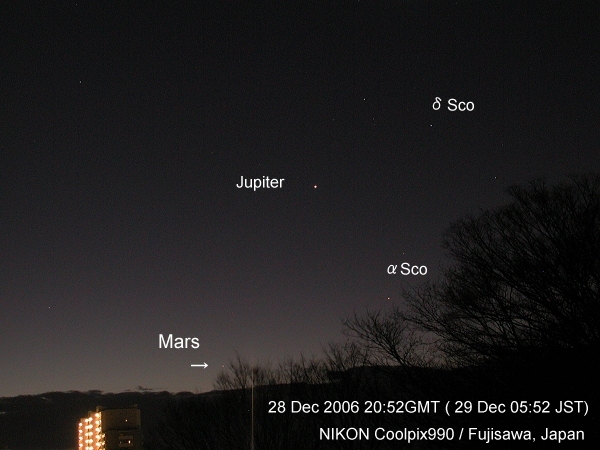 The picture here shows Mars above the horizon near the rising Scorpius (taken by MURAKAMI (Mk) a few days ago). 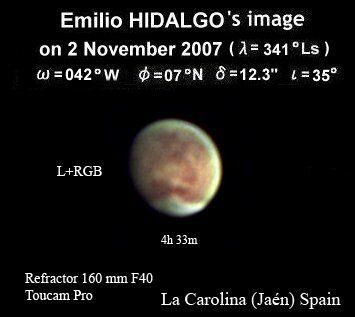 The planet will gain the angular diameter δ=4" on 10 January with φ=1°S, and λ=164°Ls. 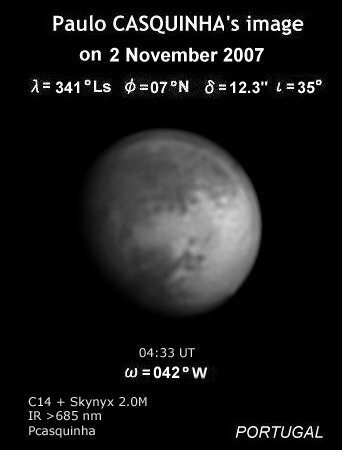 The diameter δ=10" will be realised at the beginning of October 2007 when the season proceeds to λ=320°Ls. 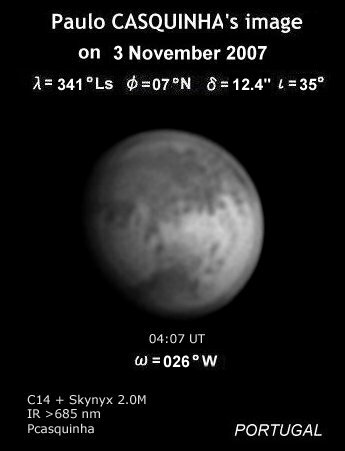 The northern spring equinox λ=000°Ls will visit at the beginning of December 2007, and the biggest disk will be attained on 18/19 December 2007. 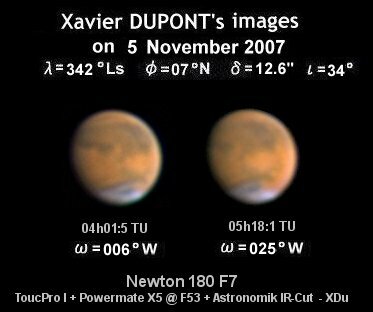 Thus 2007 is really the Mars Year throughout the whole year. 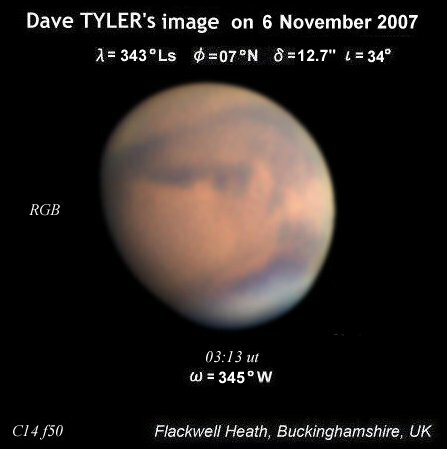 We should say the season of the red planet is really come since the disk diameter δ is now over 5 arc-seconds and the elongation from the Sun exceeded a half of the right-angle. 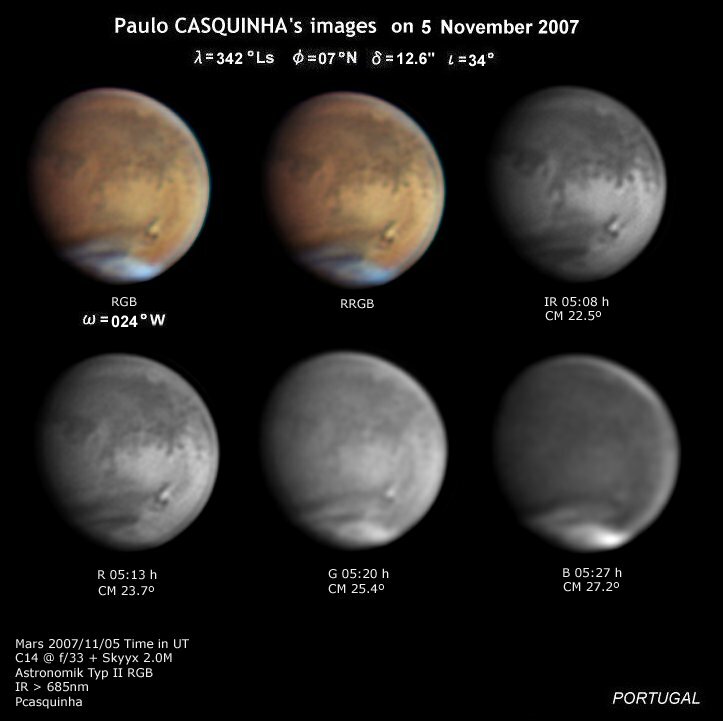 We have set up the CMO 2007/2008 Mars Gallery corner, and sincerely welcome the upcoming Mars images from the readers. C. Noachis dust has been entrained! A bright dust streak was detected at Noachis on 24 June by David MOORE at Phnix, Arizona, and on 25 June by Jim MELKA at St Louis, Missouri. See the CMO-Gallery. 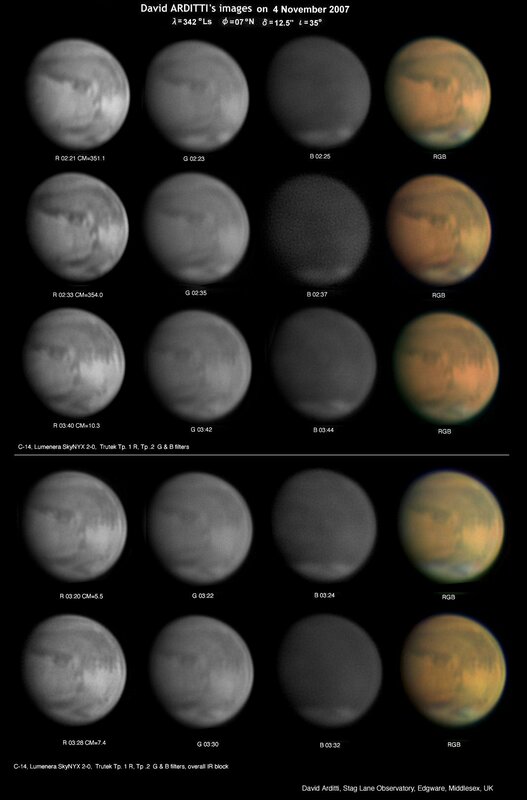 The Martian season was λ=264°Ls as expected: Since this is quite akin to the emergence period of the 1971 great dust storm, its aftermath is expected to be well chased. The area will face to Japan this weekend. 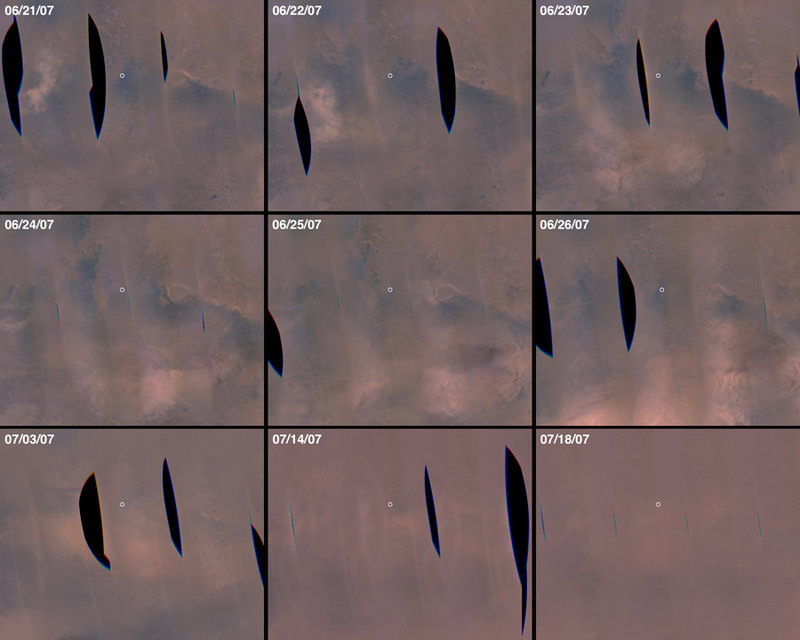 We have been aware of a series of the mosaics of images recently published by the Mars Reconnaissance Orbiter group which prove that the present dust was onset before 24 June. 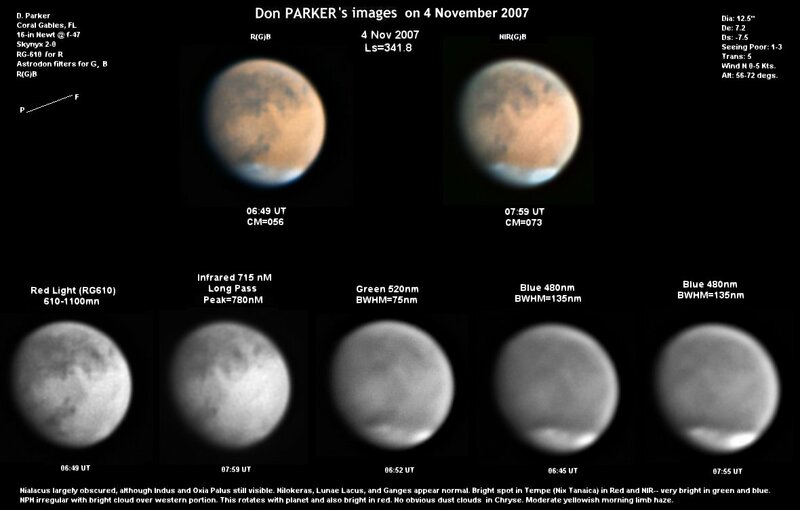 The mosaics were acquired by the Mars Reconnaissance Orbiter (MRO) Mars Color Imager (MARCI). See also an MSSS page. 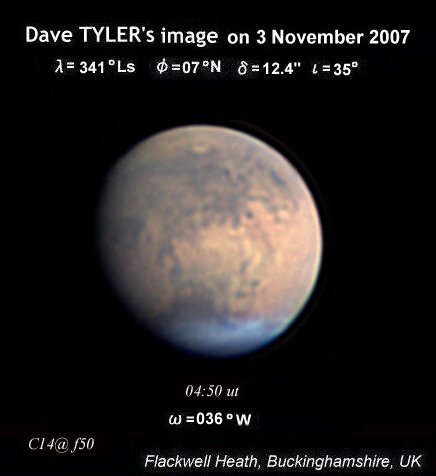 The dust was near Argyre on 23 June, and it must have been also a further resonant core of a dust which started around Eos circa 21 June. 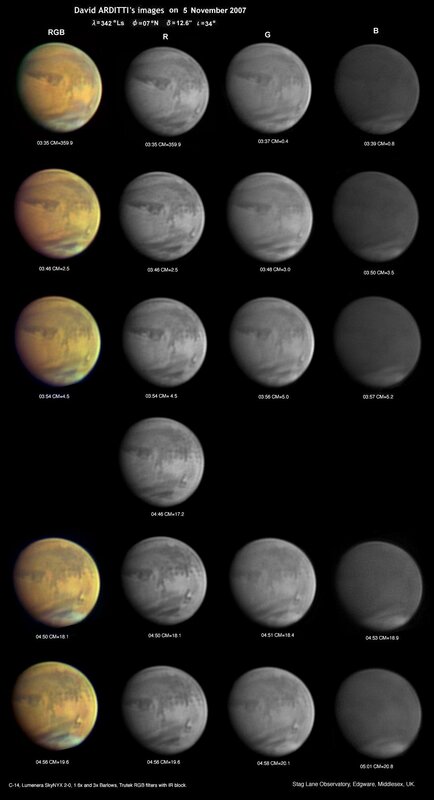 Since the dust has grown furious nowadays, the Mars Exploration Rovers, especially Opportunity, are now facing difficulties. See the most recent MRO Mission News. 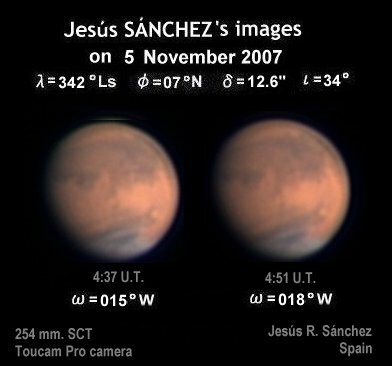 It was regarded in CMO #337 that the Noachis dust storm which started at the end of June (at λ=264°Ls) had passed its half-life period at the end of September at around λ=320°Ls. 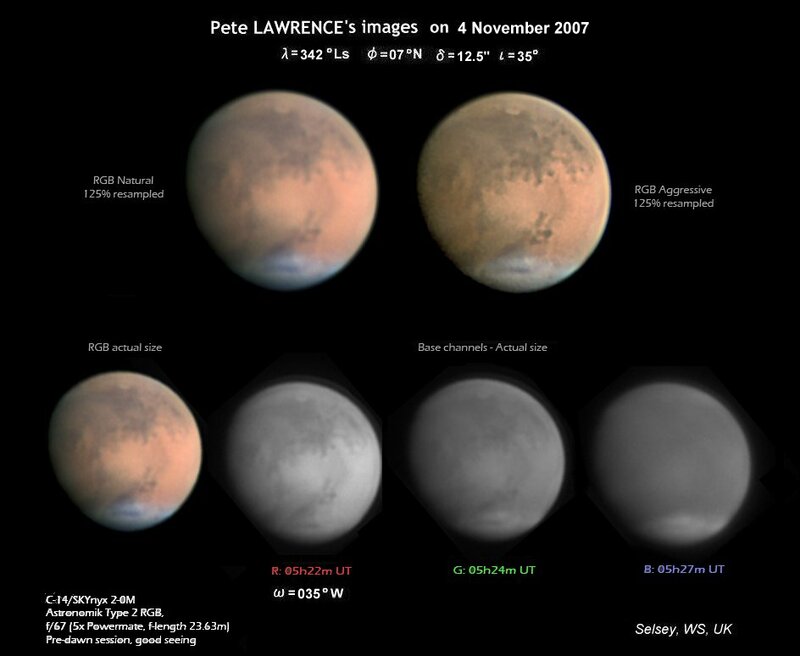 The removal of the sediments of dust from several dark markings is however another story. On 2 November (λ=341°Ls), some resonant bright dust cores were found in Europe at the Nilokeras area (called Nilokeras corridor by Ch PELLIER CMO #325) by Jesús SÁNCHEZ (JSc) and Dave TYLER (DTy) (see also Paulo CASQUINHA (PCq) and Emilio HIDALGO TORTOSA (EHd)). 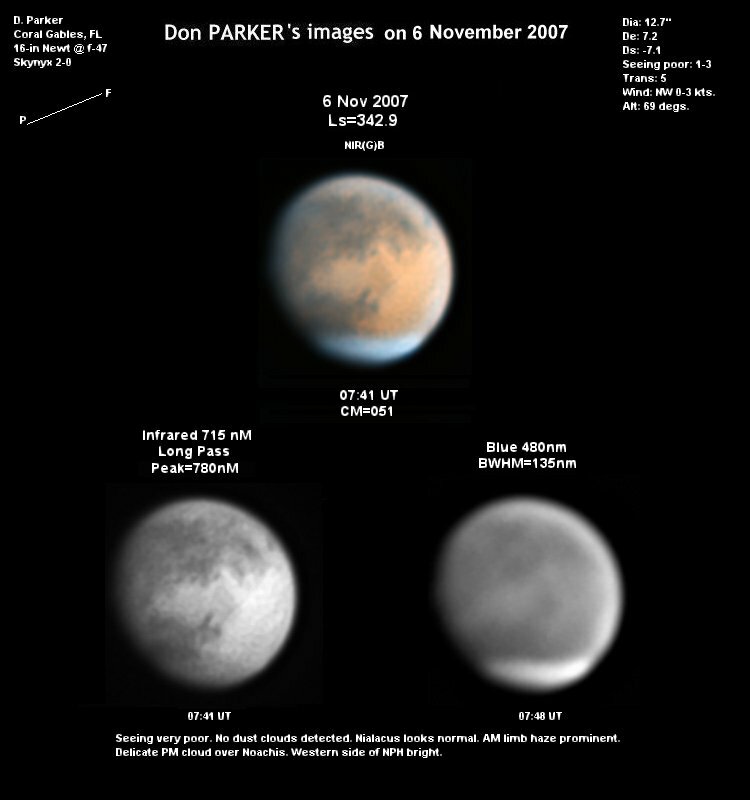 On the following 3 November, the area Niliacus L was quite obscured by a grayish dust (see DTy and PCq), and on 4 November its effect was extended to the eastern part of M Acidalium (see David ARDITTI (DAr), EHd, PCq, Pete LAWRENCE (PLw), DTy, Ian Sharp (ISp) and Don PARKER (DPk)). On 5 November (λ=342°Ls), a small but bright resonance core appeared inside the nipper of Nilokeras, and was traced from the morning to the evening by DPc, DAr, ISp, Xavier DUPONT (XDp), JSc, PCq and by Bill FLANAGAN (WFl). 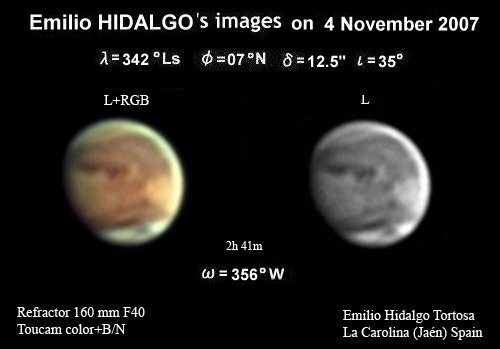 On 6 November (λ=343°Ls), however, the area looked recovered its usual features (see DTy and DPk). 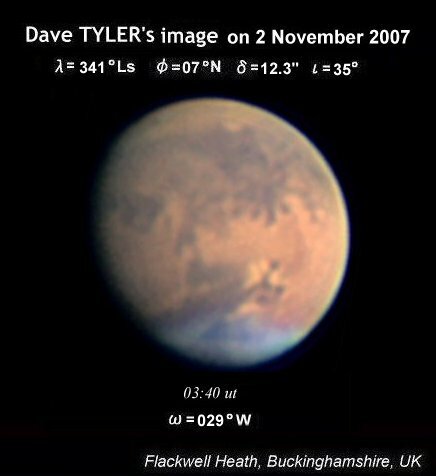 A communication on 19 December of Dr Bradford A SMITH to Mr Takeshi SATO informed that Shotaro MIYAMOTO's name had been put on a 160 km crater on Mars based upon T SATO's proposal in 2001. 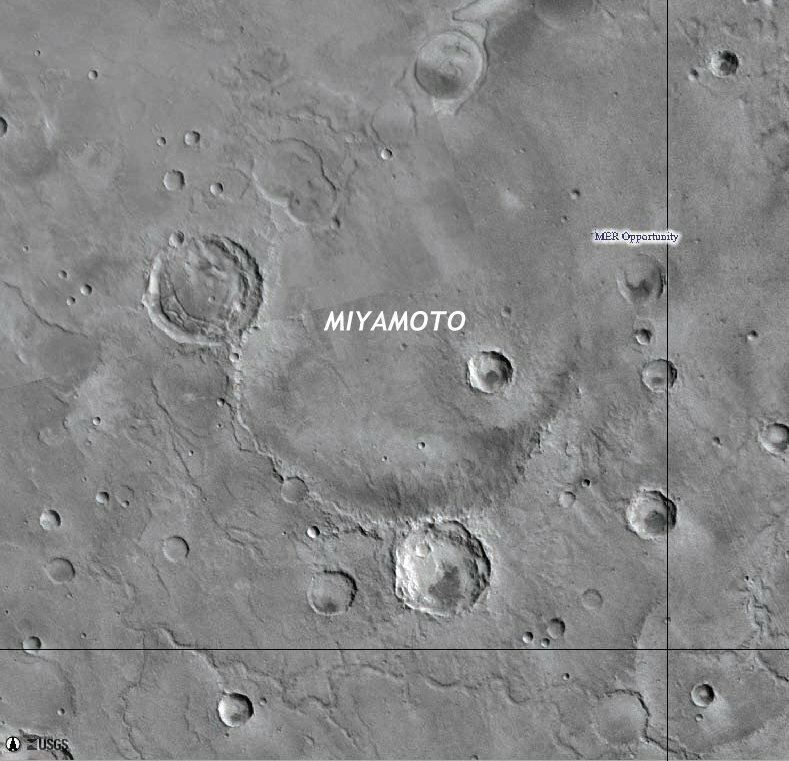 S MIYAMOTO (1912-1992) was a late professor of Kyoto University and was a visual observer of the planet Mars at the Kwasan Observatory from 1956 to 1973. 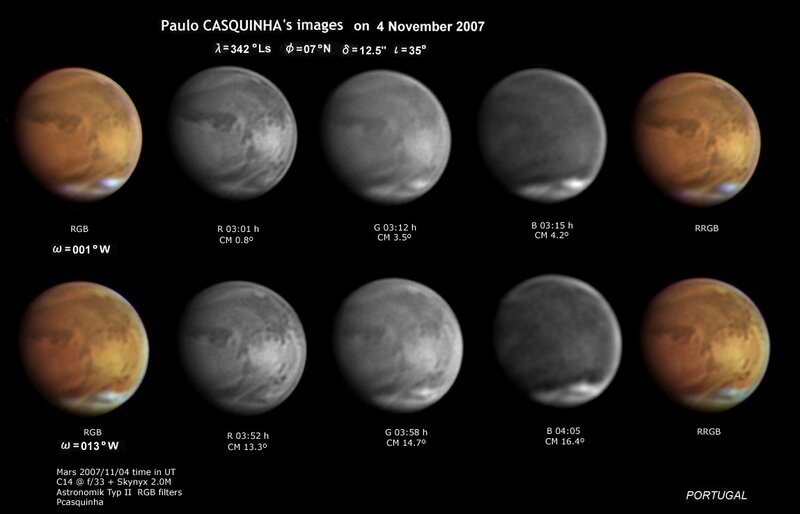 According to Dr B SMITH, the name has now been approved by the IAU and is official. 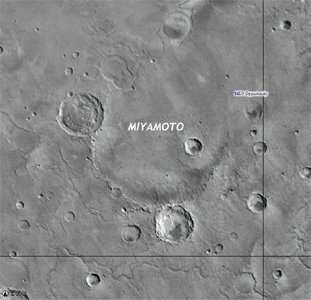 It is a degraded crater but it has attracted a lot of scientific interest and is being considered as a landing site for the Mars Science Laboratory. The information that appears in the official IAU database is listed below. 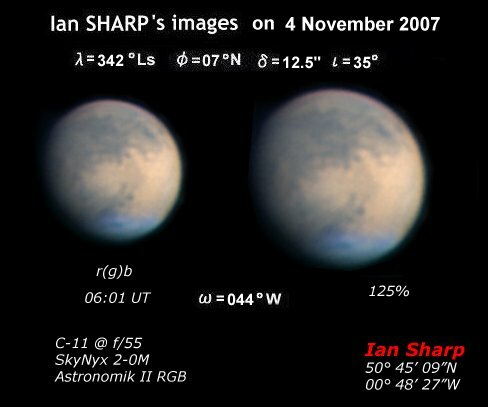 Sean WALKER, Chester NH, USA, produced an excellent 2007 animated Martian globe based on his 14 best images recorded between 5 October (λ=326°Ls) and 31 December 2007 (λ=010°Ls). He made use of a Newtonian having a 32 cm speculum. 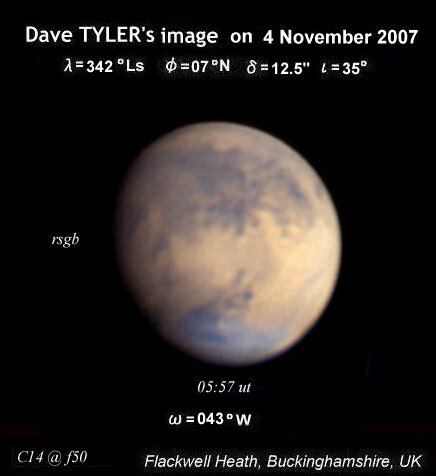 This 2007 globe well shows the devastated Martian markings because of the preceding great dust storm which started largely from Noachis in June 2007. By the opposition time the floating dust globally subsided, and the water vapour became quite active. The north polar hood near the CM is real, while it should be noted that this globe does not realise the actual daily evening and morning mists.